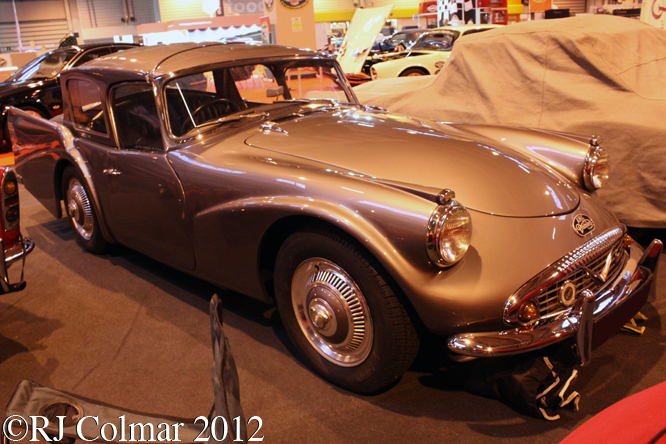 Thanks to the generosity of Ted Walker I found myself making a trip to the National Exhibition Centre at Birmingham at the weekend for The Footman James Classic Motor Show, billed as ‘The place to share your passion for cars”, today’s blog features a random selection of some of the 1500 motor vehicles that were on display. 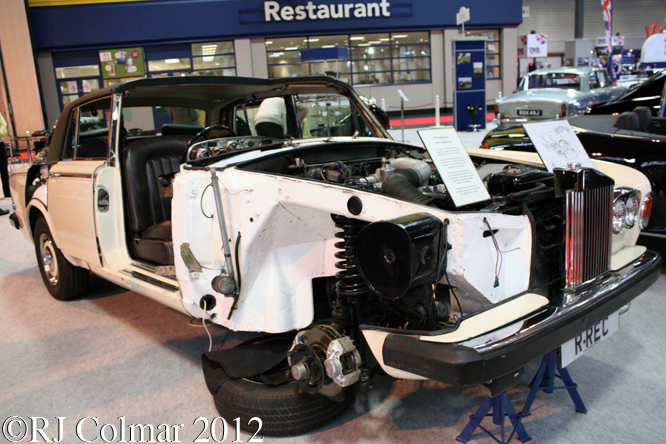 On the Daimler SP250 Owners Club stand was this unique 1960 AHC Daimler SP250 was rebodied by King & Taylor so that it could be used for a prototype electro hydraulic operated rigid roof that was patented by Anthony H Croucher in 1964. After a six year hiatus in car production Lea Francis prepared the Lynx Roadster in 6 months using a chassis which dated back to the 1948 14hp Sports, a Ford Zephyr Mk II 6 cylinder motor with new rack and pinion steering and disc brakes in time for the 1960 Earls Court Motor Show. 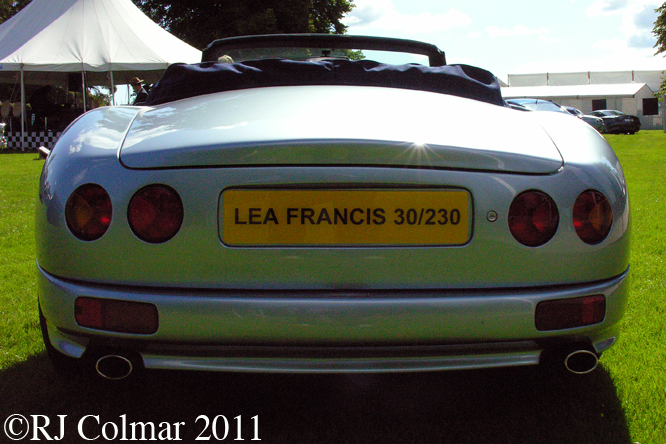 Seen on the Lea Francis Owners Club stand is the 2nd car of three built, which appeared on the Earls Court stand in this colour but sans motor. 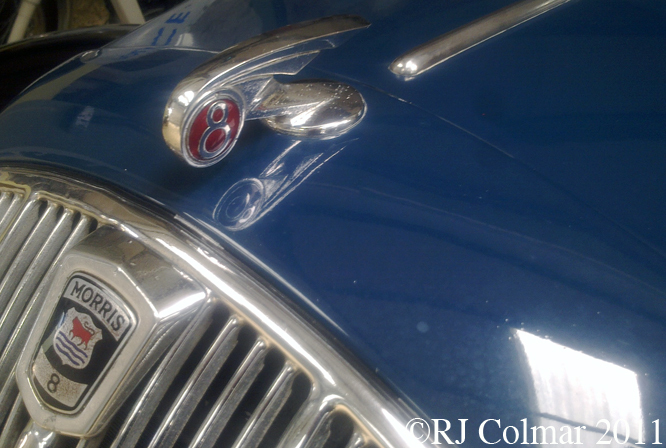 No orders for the ‘new’ car were taken and the Company went into receivership in 1963. 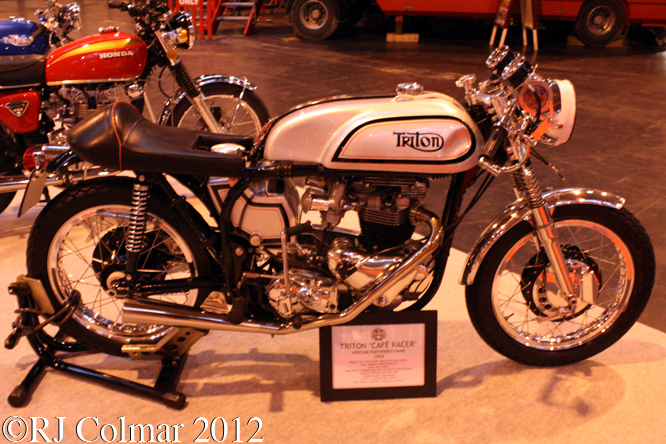 Whilst I have never been a motor cycle man I do hope at some time in my life I might get to ride a Triton like this 1959 750 example, on a suitable piece of open track, these café racer specials combine a Norton frame said to be the best handling at the time, with a Triumph twin motor said to be amongst the most reliable at the time. What do Porsche, Lamborghini and Ferrari have in common ? 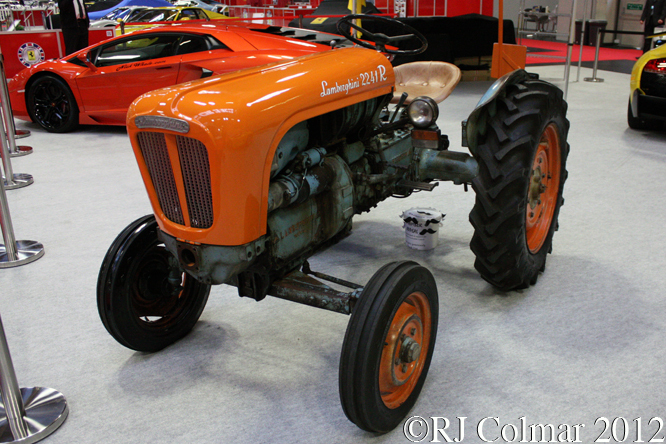 These names all appear on agricultural vehicles. 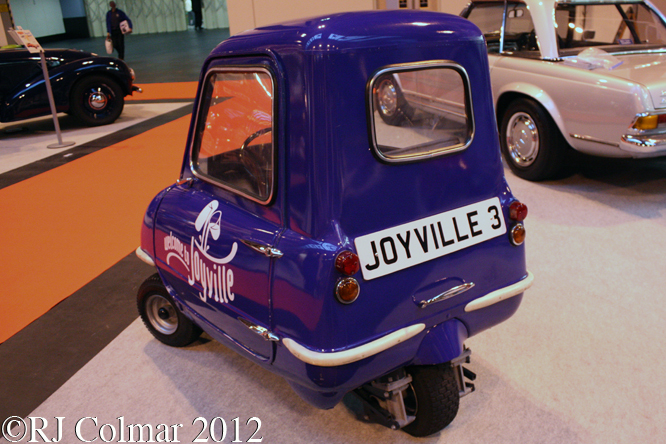 Here on the Lamborghini Club UK stand is a 1960 Lamborghini 2241 R.
The Peel P50 was designed to take carry one person and a brief case to work, indeed a 6′ 5″ TV presenter once did exactly that droving through office corridors and driving into a lift to reach his office, in the worlds smallest production car a record it has held since 1962. I am not sure if the one seen here is a replica, one of the new one built since 2011 or one of the 27 known survivors from the original batch of 50 built on the Isle of Man, but it was used earlier this year for a chocolate TV advertisement. 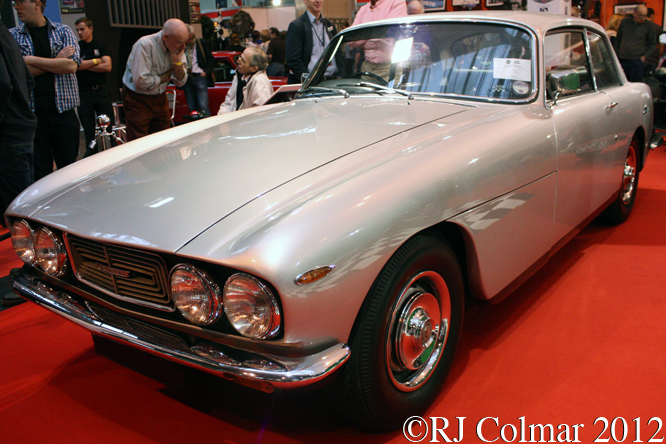 The de Tomaso Guará was the last project brought to fruition by founder Alejandro de Tomaso. 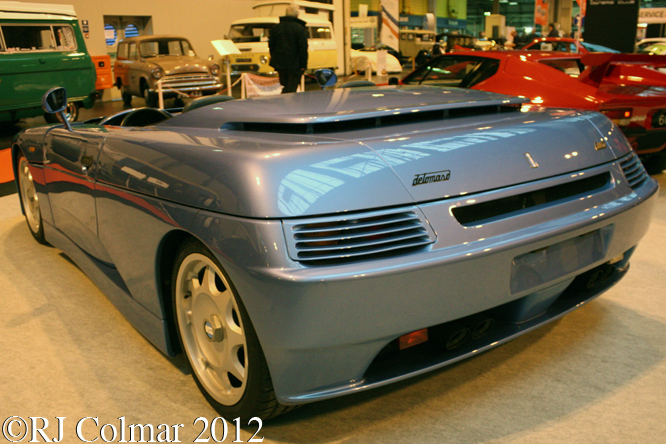 Between 1993 and 2004 around 50 are thought to have been built the one seen here on the de Tomaso Drivers Club stand being one of no more than 12 Barchetta’s. Unfortunately when I was visiting the show was still not open to the public so many of the stands were unmanned so I did not find out anything about this Bubble Top Hot Road on the National Street Rod Association stand. If you know anything about the bubble top please chime in below. A couple of weeks I made my first ever e-bay bid for a Wartburg 353, albeit for a 1/32 scale slot car racer. Seeing the real thing I regret not being more experienced at the time, the slot car went for just £8.00. This particular model on the Wartburg Trabant IFA Club stand started out life as a taxi in East Germany and has been restored to original colour and condition. 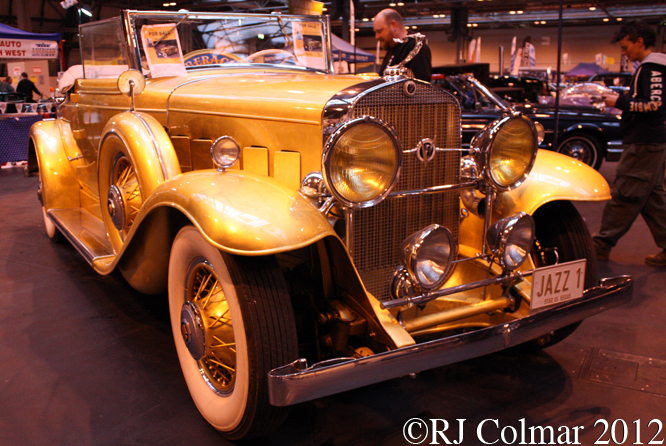 Perhaps the ultimate in bling is this 1931 Cadiallac 355 on the American Auto Club North West stand, according to the description it is covered in 23.5 carat gold leaf, has a mink over carpet, and 7 diamonds in each wheel ! The car spent many years in a German motor museum where it is described as having been the property of the pianist Liberace, who was very popular in Germany, however no one is able to verify the veracity of the claim but on the other hand who else could possibly have anything approaching such chintzy taste in motor vehicles ? If this floats your boat the car was for sale. 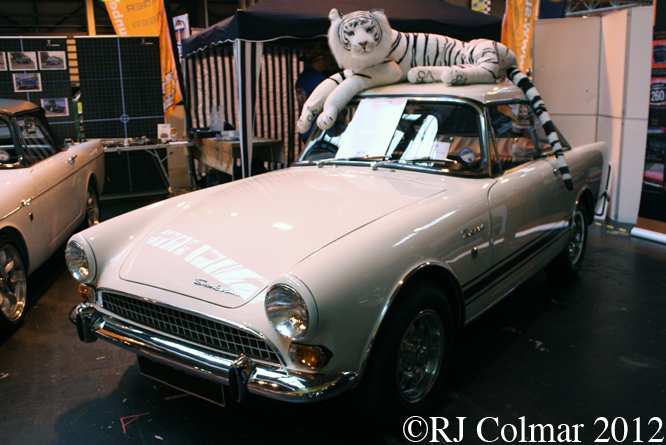 Several rare and storied Sunbeam Tigers were on the Sunbeam Tiger Owners Club stand, the one seen here is one of only 10 Right Hand Drive Mk II models built, the first 6 went to police traffic enforcement agencies and four more went to dealers, this one went to the Hatfield Rootes Group dealers W Waters & Sons and remained in the family until 2009. 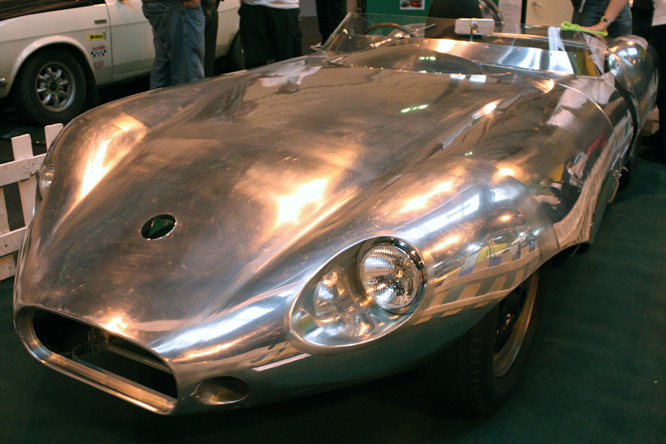 This 1958 Elva Mk III is usually on view in The Technology Collection at the Bexhill Museum. 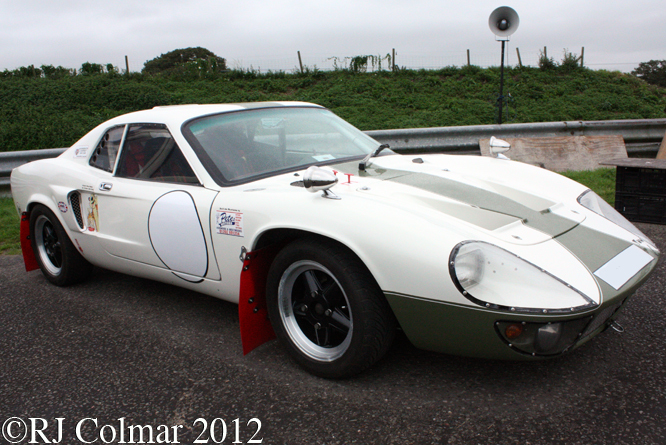 Bexhill on Sea has a ‘disputed’ claim to being the birth place of British Motor Racing and was home to Elva until the company moved to bigger premises in Hastings where I believe this Mk III would have been built. 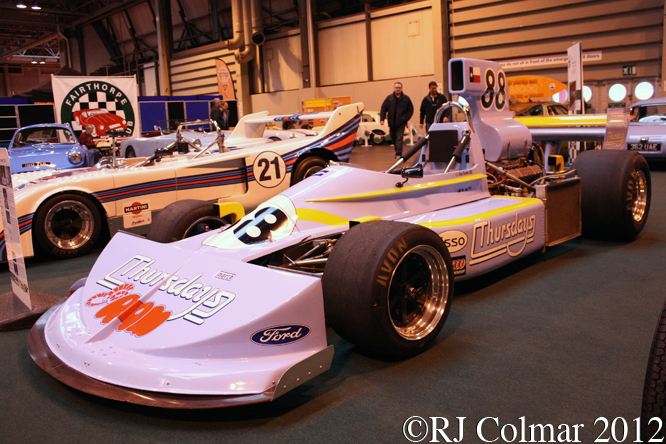 This March 75A Formula 5000 has gone through many changes the original ’75 Formula 2 chassis tub was swapped for a ’76 Formula 1 chassis tub in 1977, the engine was originally a 3.4 litre / 207 cui Ford GAA V6 before it got swapped for a 3.0 litre /183 cui Ford DFV V8 and then a 5 litre / 305 cui Repco V8 it has won races driven by yet to be World Champion Alan Jones in ’75, Damien Magee in ’76, Guy Edwards in ’77 and to sprint victories Terry Smith Brighton and on the Isle of Man in ’79 and ’82 respectively. 75A/1 is now fitted with an original spec Ford GAA V6 motor and the March 761 formula 1 chassis tub from it’s second 1977 incarnation. On the Rolls Royce Enthusiasts Club stand there were several cut away items on display including this Rolls Royce Silver Shadow II. This 1987 Ford P100, on The Mk III Cortina Owners Club stand, would originally have carried a Ford Sierra front end but it has been modified to carry older Cortina Mark III wings and bonnet and nose. 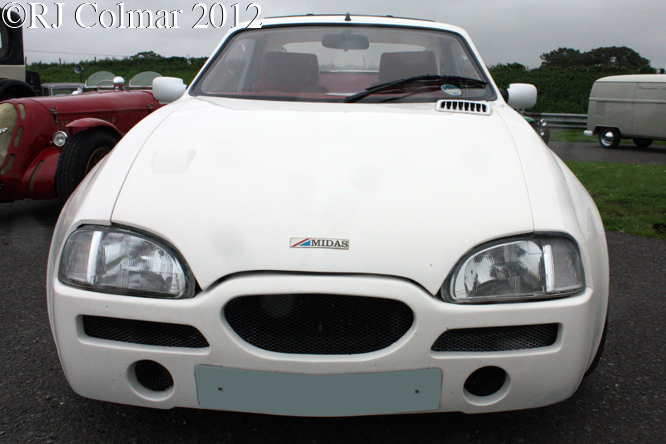 It is fitted with a Ford Cologne 2.9 litre / 176 cui V6. Austin’s Allegro replaced the various badge engineered ADO16s in 1973 with its curiously for the time rounded styling and a novelty ‘quartic’ steering wheel that was subject of much period derision. 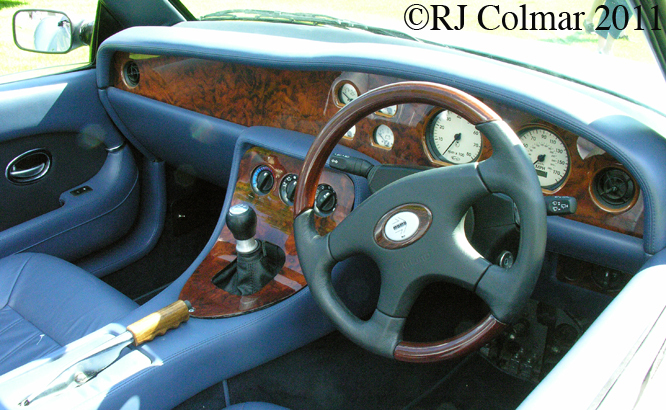 The ‘quartic’ steering wheel was quickly and quietly dropped. 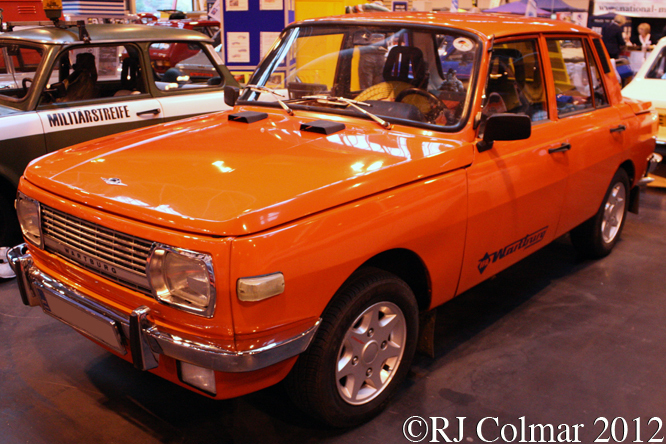 In 1975 Series 2 Allegros, like the 1977 HL seen here were introduced. 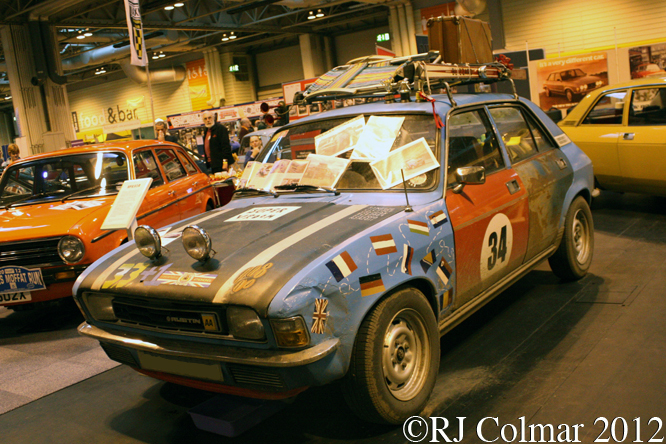 I was recently at a talk given by Mike Nicholson who was a works British Leyland co driver who took part in the 1975 RAC Rally with Pat Ryan and he reckoned reliability issues aside it was not a bad car. The car above seen on the Allegro Club International stand was bought for parts in 2007 and when it was realised the body was still solid it was repaired and sold by the current owner to friend, requiring further repair the current owner bought it back fixed it up and took it on last years Rat Rod Rally2Romania, to find out what happens next you will have to read the Allegro Club International newsletter, Quartic. 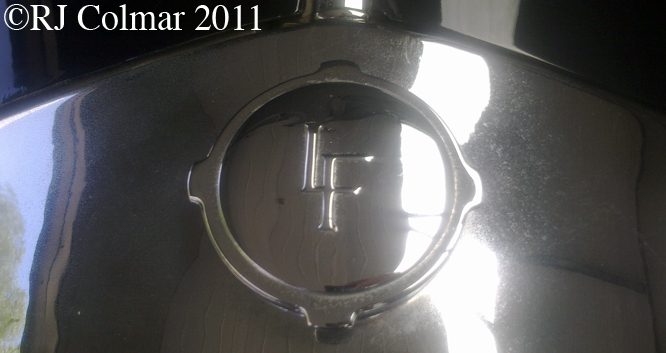 On the Ford Sidevalve Owners Club stand I found a manufacturer I have never heard of. 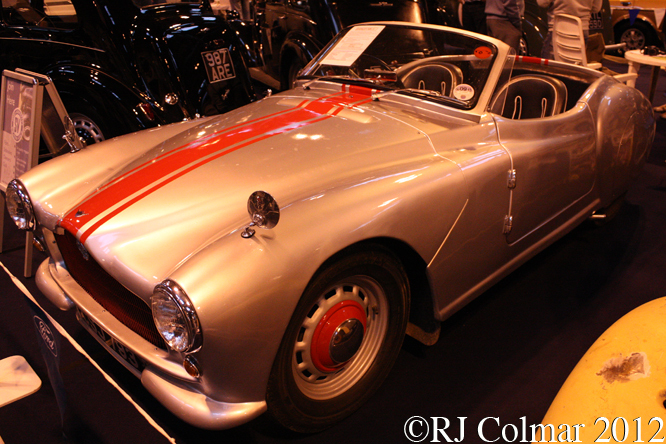 Shirleys were built at the Monks Path Garage at Shilrley, Solihull outside Birmingham. Originally these GRP bodies were known as Kenmars. 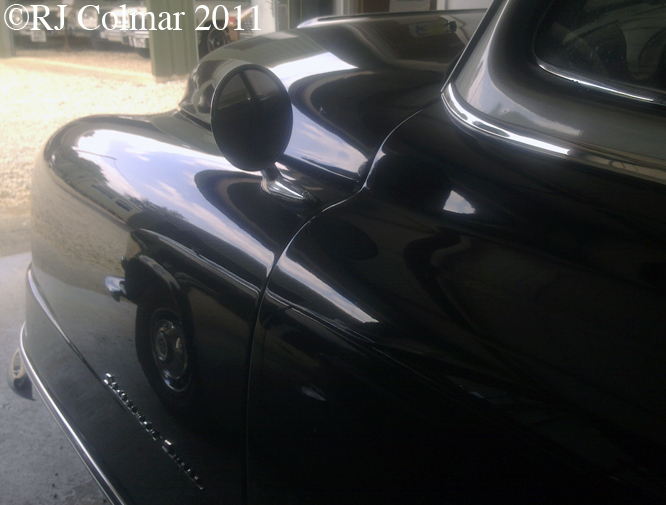 This Mark II with revised nose was purchased as a body believed never to have been fitted to a chassis in 2007, it now sits atop 1949 Ford Anglia chassis and running gear. Production of Shirleys came to a halt in 1962. 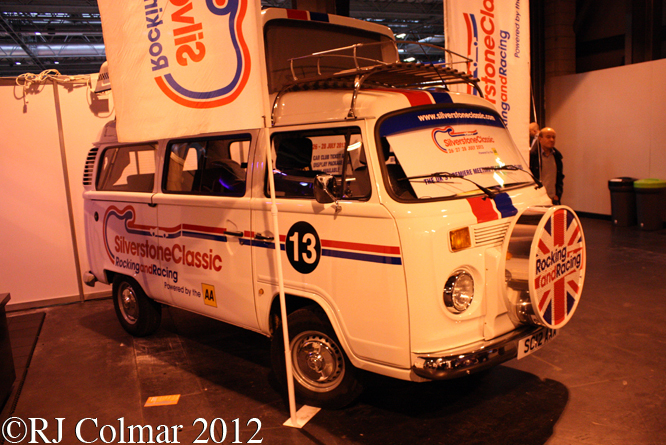 Silverstone Classic were represented by this 2012 Volkswagen Type 2 (T2c) production of which will be coming to a halt in Brazil next year. 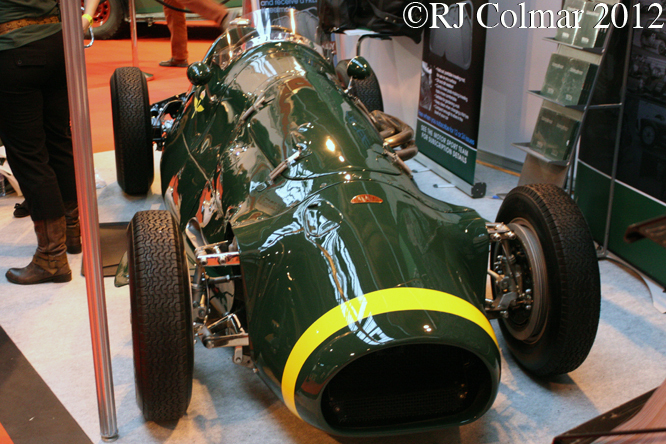 On the MotorSport Magazine stand I found this Connaught Type A Formula 2 car, I’m not sure of it’s history but it will give me something to work on. If you know the history of this car please chime in below. Finally on the Classic of the Year stand this Bristol 411 was on display voting is closed and the winner will be announced on November 21st. The Bristol was bought and restored by the present owner in time for him to take it to Amsterdam where he celebrated his 50th Birthday. My thanks again to Ted Walker of Ferret Photographic for facilitating today’s blog. Thanks for joining me on this “The Footman James Classic Motor Show” edition of “Gettin’ a li’l psycho on tyres” I hope you will join me again tomorrow. Don’t forget to come back now ! 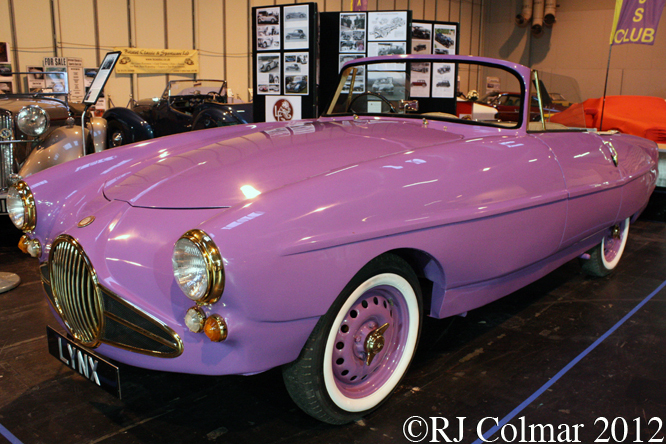 This entry was posted in Uncategorized and tagged AHC, Austin, Birmingham, Bristol, Bubble, Cadillac, Connaught, Daimler, de Tomaso, Elva, Ford, Francis, Lamborghini, Lea, March, NEC, Peel, Rolls Royce, Shirley, Sunbeam, The Classic Motor Show, Top, Triton, Volkswagen, Wartburg on November 19, 2012 by Ralph. Last Sunday I managed to pop out for a couple of hours to catch the 5th Rare Breeds Show at the Haynes International Motor Museum. 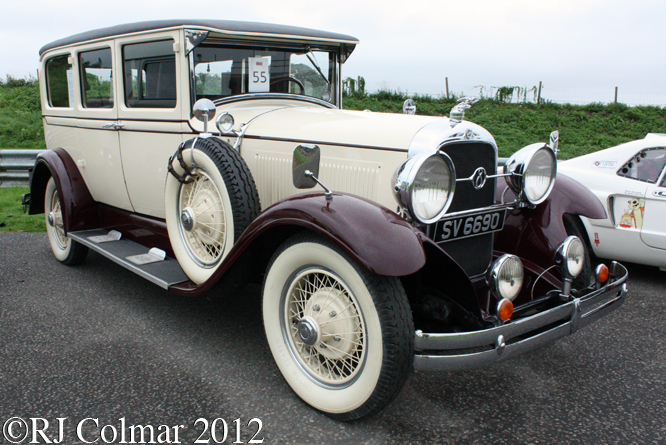 Back in 1928 $2,450 could get you this Studebaker President 8 Limousine powered by a 100 hp 5121 cc / 313 cui straight 8 motor. This car which competed on price with Chrysler and Buick but in interior finish with Packard and Duesenburg, was built in Walkerville Canada and is believed to be the only one of 2450 built still on the road. It is operated as a wedding car by vintage-wheels.co.uk. 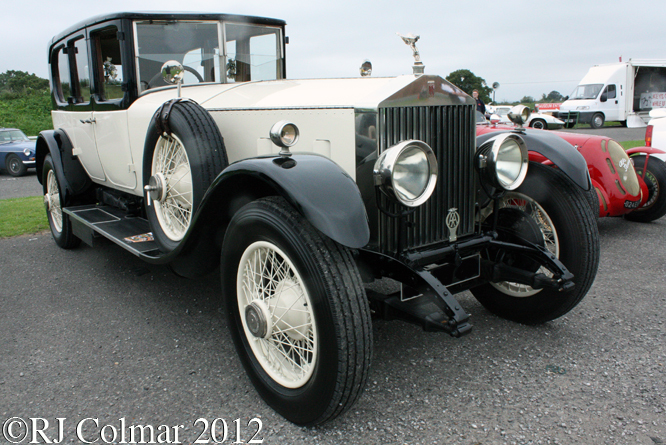 Rolls Royce New Phantoms, built from 1925 to 1929 replaced the Rolls Royce Silver Ghost series, with a new overhead valve six cylinder motor replacing the side valve motors of the earlier models. These cars were built in Derby England and Springfield Massachusetts. This 1929 model would be one of the last New Phantoms built, they were replaced in 1929 by the Phantom II at which point New Phantoms became retrospectively known as Phantom I’s. I hope you are paying attention in the back there, this car was one of several at the rare breeds show operated by rrelite.co.uk. Weighing a ton but armed with a 87 hp motor a Lea Francis 14(taxable)hp Sports could reach 87 mph with steering and, rod operated, brakes to match. Unfortunately it’s price meant just 111 of these car were built between 1947 and 1949. This 1948 example is one of over 40 known survivor’s. 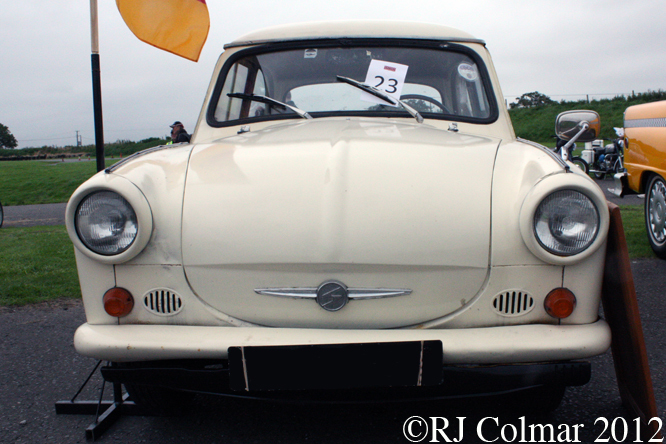 With a name that translates from German to Russian into Sputnik the East German Trabant P50 was launched in 1958 with two cylinder 18 hp 500 cc / 30.5 cui aircooled two stroke motor derived from a pre war DKW. The body made extensive use of Duroplast made from recycled cotton waste from the Soviet Union and local phenol resigns from the dye industry. This 1962 P60 is fitted with the more power powerful 23 hp 600cc / 36.6 cui motor that would remain in production, from 1964 in the ‘updated’ 601 series bodies, until the collapse of the Berlin wall 1989. Despite having only 27,000 miles on the clock this 1966 Volkswagen Type 2 has many stories to tell, it started out like as a fire truck at Zurich Airport, it has rare for the period sliding doors on both sides to facilitate access to the fire pump that used to be inside. It then served as a fire truck in a Swiss Village, with 15,000 miles on the clock it came to the UK in 2003 and was bought and returned to it’s original factory supplied colours by Ross Gammie who discovered that it’s 53 hp was not really enough to pull his Porsche 908 race car. Since it’s redesignation as a race support vehicle the van with it’s period correct Porsche 356 wheels has since changed hands again. 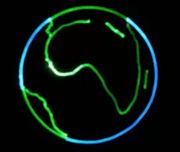 Amazingly the FT Bonito Special above also started life as a Volkswagen, a 1967 Beetle, before a conversion was started in 1986 to turn the bug into an FT Bonito, a kit car from a company called Fibrefab. 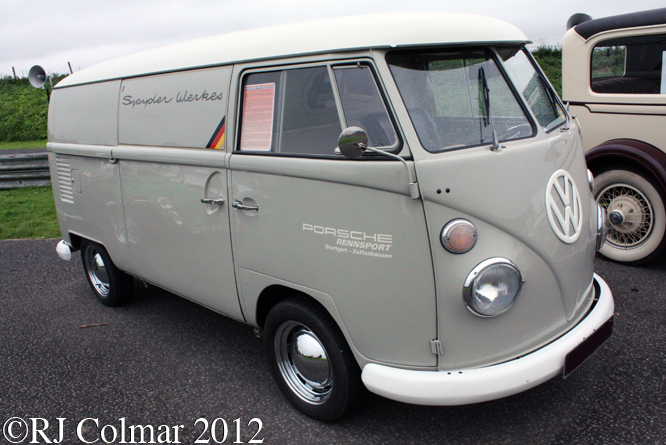 The current owner found it unfinished in a garden in 1999 and has since brought it too life with a VW Golf motor. This is thought to be the only competition version of an FT Bonito ever to have been built. 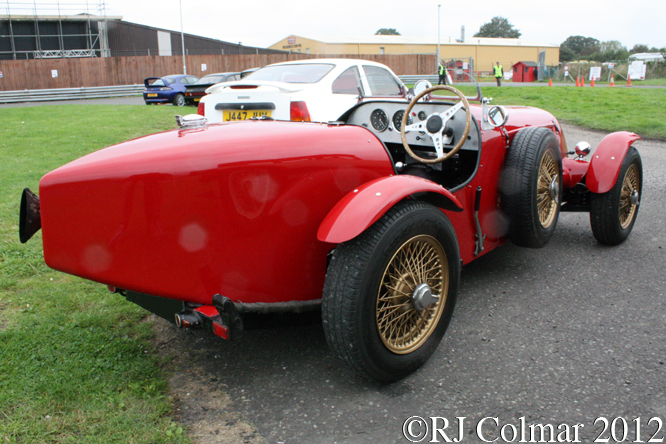 David Roots Lenham ALFA Romeo special was looking resplendent, even on a dull day, as usual. 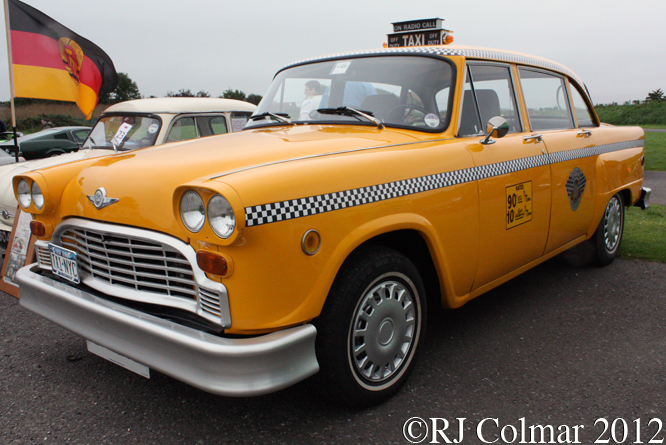 The New York ‘cab’ above is a 1978 Checker Marathon with a 160 hp 5735 cc / 350 cui V8 motor. 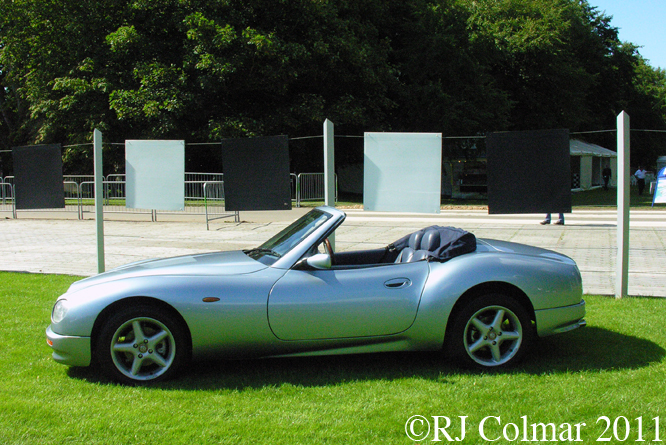 The car is also operated for weddings and filming by rrelite.co.uk . Among it’s credits is an appearance in the 2008 Boyzone number Love You Anyway. 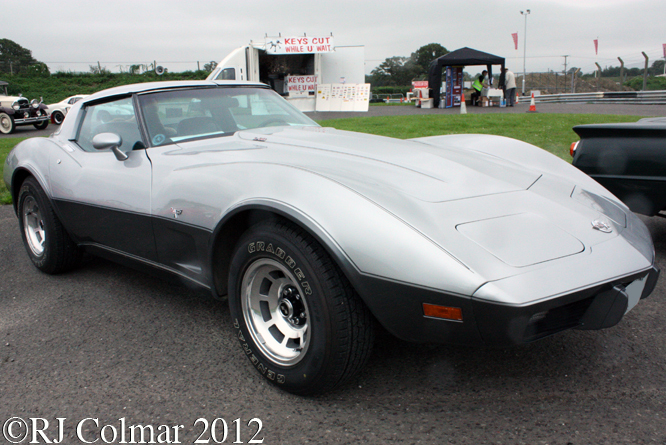 I looked in detail at a Chevrolet Corvette C3 some weeks ago the 1978 model seen here has the $399 B2Z 25th Anniversary option two tone paintwork along with the 25th Anniversary mandatory $380 option aluminium wheels and sport door mirrors. 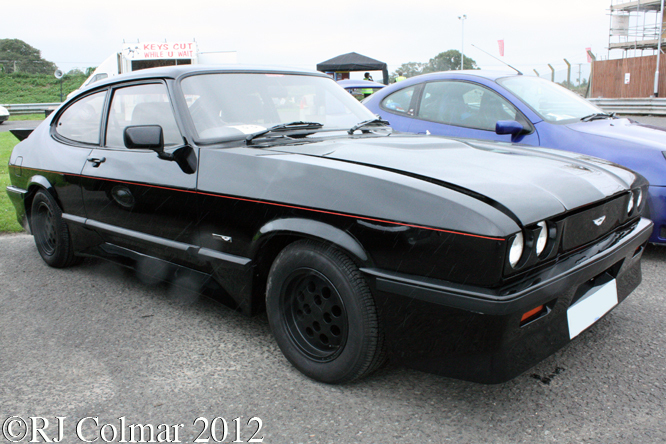 The Tickford Capri is a Ford sanctioned hand built Ford Capri with a 205 hp turbocharged motor that cost double the price of a standard 170 hp Ford Capri 2.8i. This 1984 example #002 was the first type approved version, ordered by someone desperately keen to have one built as close to the prototype show car before Tickfords had even moved into the planned production facility for the series. The 1984 Pontiac Trans Am based Knight Industries Two Thousand (K.I.T.T) was developed for the Foundation for Law and Government (FLAG) by Wilton Knight and was essentially an artificially intelligent electronic computer module installed in an advanced, mobile, robotic automobile. 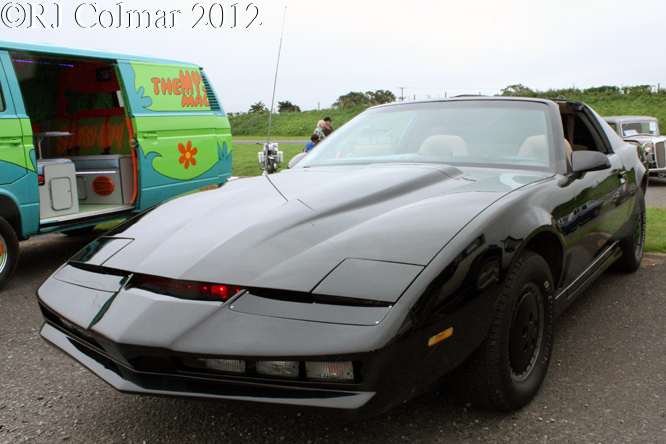 The original 1982 K.I.T.T was a hard top, but no doubt in danger of getting a hot head due to his crime fighting success, it was deemed that Micheal Knight be given a Targa Top for the 1985 crime wave. 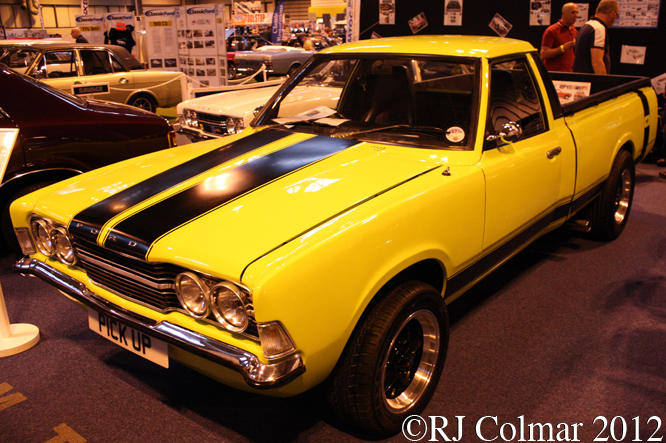 This particular K.I.T.T thought to be one of thirty built is operated by rrelite.co.uk. This 1991 Midas Cortez is the spiritual ancestor of the Mini Marcos with Rover Metro running gear. Thanks for joining me on this “5th Rare Breeds Show” edition of “Gettin’ a li’l psycho on tyres” I hope you will join me again tomorrow. Don’t forget to come back now ! This entry was posted in Uncategorized and tagged Alfa, Bonito, Breeds, Chevrolet, Colmar, Francis, FT, Haynes, Indistries, International, Knight, Lea, Lenham, Motor, Museum, Ralph, Rare, Rolls, Romeo, Rover, Royce, Studebaker, Thousand, Tickford, Trabant, Two, Volkswagen on September 10, 2012 by Ralph. In August 1895 Richard Lea and Graham Francis entered into a partnership to manufacture bicycles, like the another cycle turned motor manufacturer Rover, Lea Francis was based in Coventry. In 1903 Lea Francis manufactured three unconventional vehicles with complex three cylinder motors that were not a success and from 1912 to 1924 the company manufactured motor cycles. Lea Francis entered motor car manufacture again in 1919 with vehicles using popular Meadows engines, Lea Francis became the first marque to offer a supercharged production car, the Hyper in 1927 and the following year a Hyper won the Tourist Trophy. 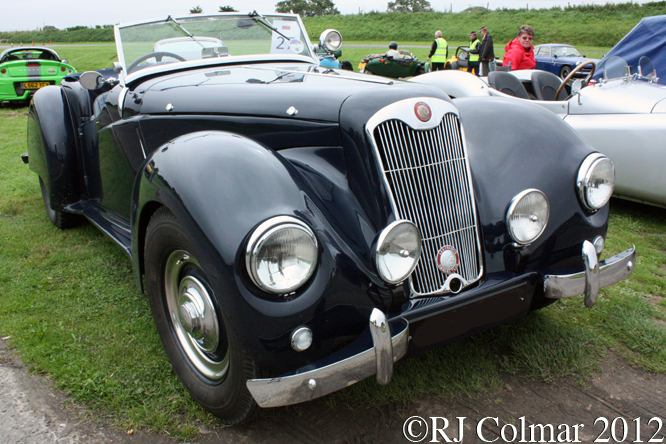 The company went bankrupt in the early 1930’s and was revived in 1937 to produce a fresh vehicle designed by former Riley engineer Hugh Rose, the successors to this car proved popular after the second world war in saloon and sports car forms. Car production ceased again in 1962 since when the company was kept alive by Barrie Price who provided spares and restoration services and occasional new low volume cars. In 1996 father of the Jaguar XJ220 Professor Jim Randle was engaged to design the 30/230 seen here at Goodwood Festival of Speed. 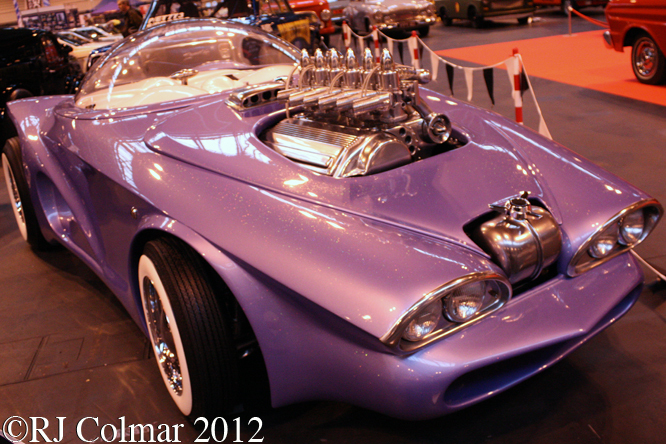 The aluminium bodied car was to be powered by a 235 hp 3 litlre / 183 cui V6 Vauxhall (UK GM) motor. Among the novel features the chassis was made by riveting laser cut aluminium panels, a process that requires no conventional jigs, and a patented active suspension system. 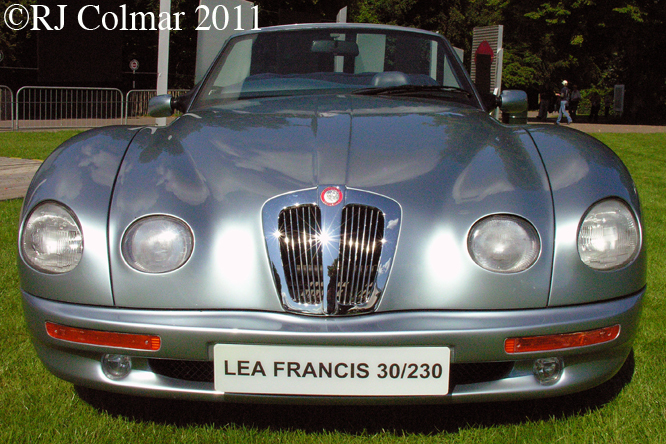 Unfortunately, like the planed Lea Francis Limousine which aimed to fill the niche left by the Daimler DS240, the 30/230 did not go into production. Thanks for joining me on this Lea Francis edition of ‘Gettin’ a lil’ psycho on tyres’. 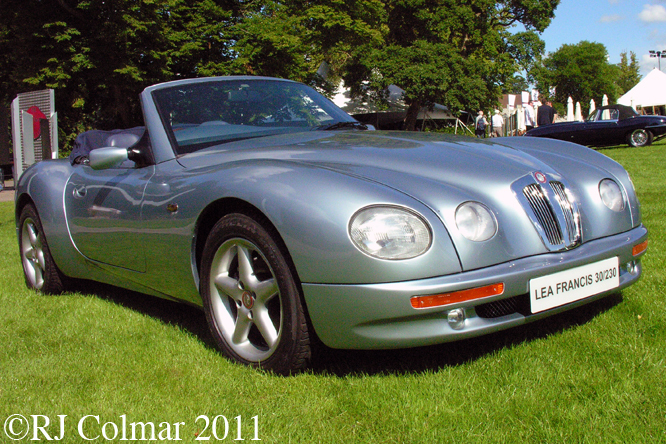 I hope you will join me again tomorrow when I’ll be reviewing some of the event’s at this weekend’s Goodwood Revival. Don’t forget to come back now ! 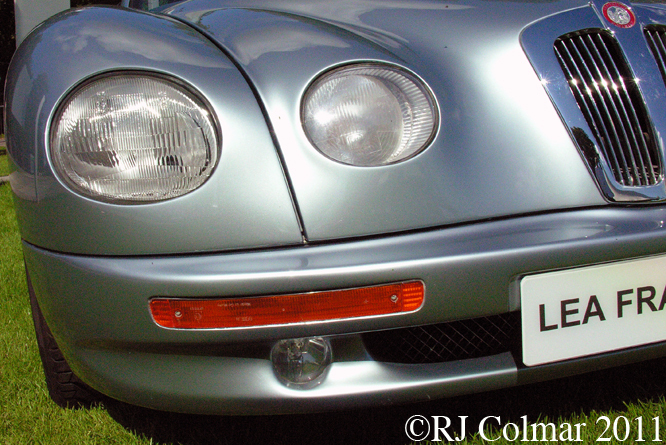 This entry was posted in Uncategorized and tagged 30/230, Art, Barrie, Car, Festival, Francis, GALPOT, Goodwood, Jim, Lea, Price, Randle, Speed, Sports, Tidesco, Vauxhall on September 18, 2011 by psychoontyres. 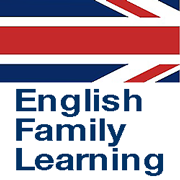 For several years now every month I have been making a trip up to London to go and see my folks, on the way back no matter what time of day I frequently find myself in a traffic jam some where around J18 on the M4 which could add anything up to an hour on my normal 2 hour journey time. About 18 months ago forewarned, by a big new electric message board on the M4, of an impending jam between Junction 18 and 20 I took a detour and followed the A338 from Junction 14 down to Upper Eddington and then followed the A4 west to Bristol. Going through Calne I passed a sign for a Motor Museum, 18 months later with a little time on my hands I managed to follow the sign about a mile down Stockley Lane and on the left I found the Atwell Wilson Motor Museum. Entrance is an unbelievably low £5 and within were over 100 2, 3, 4 wheeled vehicles, and one soon to depart 6 wheel World War 2 AEC RAF Refuelling Tanker. 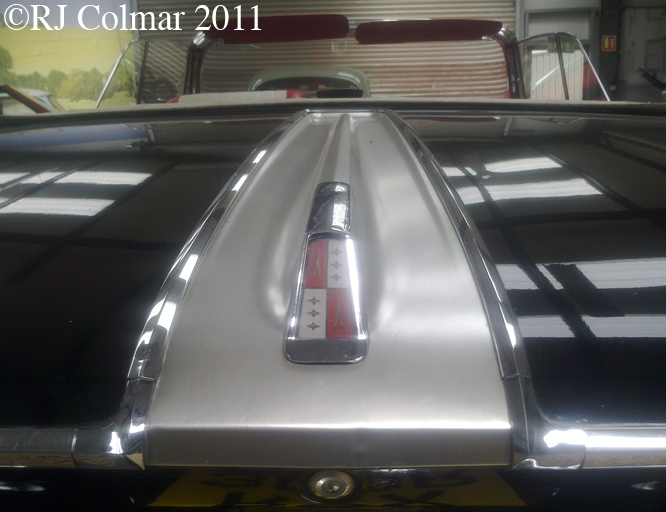 The collection can broadly be divided into vintage and classic mass production vehicles with a particularly interesting collection of Limousines both British and American which are available at very reasonable rates for wedding hire. 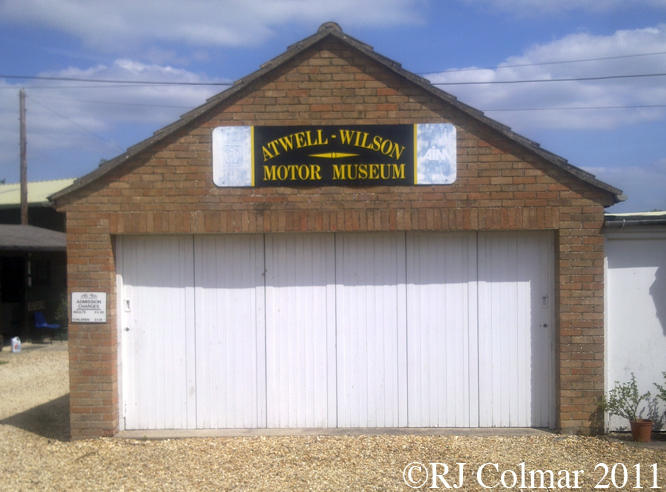 The Atwell Wilson Museum was founded by Richard and Hasel Atwell, who lived in Wiltshire all of their lives, in 1962 they started collecting vehicles with a local connection and maintaining them in a road worthy condition. Richard passed away last year, the Museum that has grown out of the collection is run by 15 volunteers. On the weekend of July 9th and 10th the museum will be hosting a classic car weekend, if you have a classic car, or even if you don’t but would like to attend call 01249 813119 or e-mail enquiries@atwellwilson.org.uk for details. I shall look forward to attending on one of the two days. Thanks for popping by today’s Atwell – Wilson edition of ‘Gettin’ a lil’ psycho on tyres’, I hope you will join me again tomorrow for a closer look at the Atwell – Wilsons 1962 Plymouth Fury. Don’t for get to come back now ! 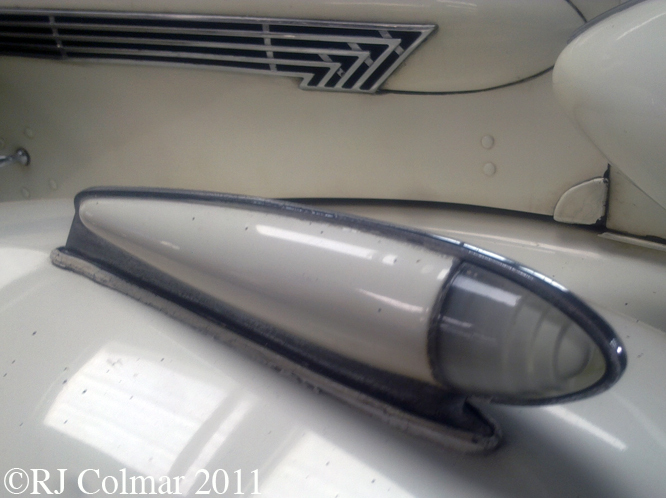 This entry was posted in Uncategorized and tagged 14, 8, 80, Art, Atwell, Buick, CX, Francis, Fury, GALPOT, Lea, Morris, Motor, Museum, Nash, Phaeton, Plymouth, Statesman, Tidesco, Wilson on June 27, 2011 by psychoontyres.